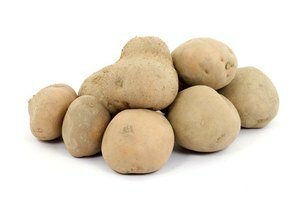 Potatoes are among the vegetables not recommended for freezing raw because of their high water content. However, par-cooking the potatoes by boiling or frying allows you to freeze potatoes without discoloration or mushiness. Waxy potatoes freeze better than starchy ones, as they have a lower moisture content. Scrub the potatoes well and cut off any discolored or papery patches. For whole potatoes, younger potatoes freeze better than older potatoes. 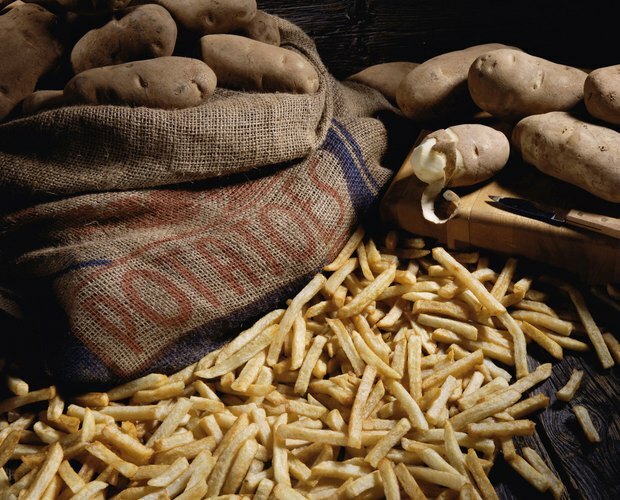 Older potatoes are more likely to become mushy when defrosted and cooked because of their higher starch content. For cut potatoes, however, choose mature potatoes that have been in storage for at least 30 days. Cut the cleaned potatoes into the desired size -- 3/8-inch sticks are recommended for french fries -- rinse them in cold water and drain to remove excess starch. Potatoes, whole or cut, can be boiled, baked or fried prior to freezing. For small, whole potatoes, blanch them in boiling water for four to eight minutes, depending on size. For 1-inch potato chunks, cook them in boiling water for four to six minutes. Cut potatoes can be blanched in a deep fryer or baked in the oven until they are fork tender. Bake cut potatoes in a 450-degree Fahrenheit oven until they soften and brown. To blanch in a deep fryer, cook them for five minutes at 360 F. The potatoes soften but will not brown. All blanched potatoes are ready to be frozen when they are fork tender. The potatoes need to be heated through to prevent enzymatic reactions during freezing. If they aren’t heated all the way through, the interior will darken once they are frozen. Immediately after browning, submerge boiled whole potatoes in ice water to stop the cooking process. For baked or fried potatoes, refrigerate them until they are cooled. Once they are cool and if necessary, drained, the potatoes are ready to be packed and frozen. Pack the whole or cut potatoes into plastic freezer bags or airtight plastic containers, pushing out as much air as possible. Leave 1/2 inch of head space in the containers. For optimal taste and texture, consume frozen blanched potatoes within 12 months of storage. The colder the freezer and the less air there is inside the storage container, the longer the potatoes keep without worry of freezer burn. 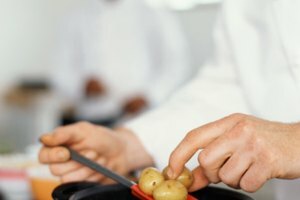 To use frozen, par-cooked potatoes, bake or fry cut potato pieces from frozen, and boil or bake whole potatoes until they are tender and warmed throughout. There is no need to thaw the potatoes prior to cooking. Cynthia Au has studied at the Cordon Bleu in Paris and currently works as a chef instructor specializing in food styling. She has worked as a writer and editor with a focus on food and food science since 2007 and regularly teaches both adults and young children about the joys of home cooking.